Averaging about 4 ft (1.2 m) in height, goldenrod is a perennial with clusters of bright yellow flowers. It has been used for centuries in the treatment of kidney stones, urinary tract infections, and a variety of other medical conditions. One legend has it that a 10-year-old boy who received an infusion of goldenrod for several months in the late eighteenth century passed 50 gravel stones larger than a pea. Native Americans used goldenrod to alleviate sore throat, and blue mountain tea made from goldenrod leaves is sometimes used to combat fatigue in the Appalachian Mountains. Goldenrod varieties belong to the plant family Asteraceae. While European goldenrod (Solidago virgaurea) is perhaps the most well known variety, other species of the plant (there are over 100 and counting) appear to have roughly equivalent medicinal properties—in particular, the ability to increase the flow of urine. In Europe, Solidago virgaurea is often used interchangeably with other species of goldenrod such as Solidago serotina and Solidago canadensis in the drug of commerce. Only the aboveground parts of the plant, mainly the flowers and leaves, are considered to have medicinal value. Goldenrod grows in Europe, Asia, northern Africa, and North America, but most medicinal goldenrod originates in Bulgaria, Hungary, Poland, and other eastern European countries. It thrives in a wide variety of habitats, including hills, woods, meadows, and rocky terrain. 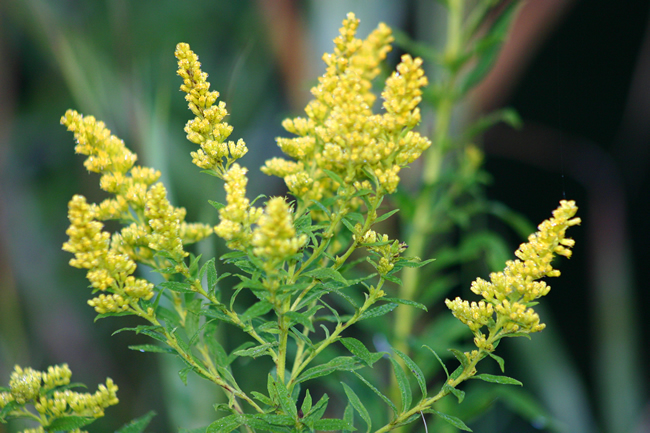 Contrary to popular belief, goldenrod does not play a significant role in triggering hay fever reactions. This myth probably developed due to the fact that goldenrod blooms around the same time and in the same places as the ragweed responsible for most seasonal allergies. Studies of goldenrod pollen indicate that it is not a potent allergen for most people. However, it is in some. Goldenrod is also a very potent anti-allergic herb for sufferers of hay fever. 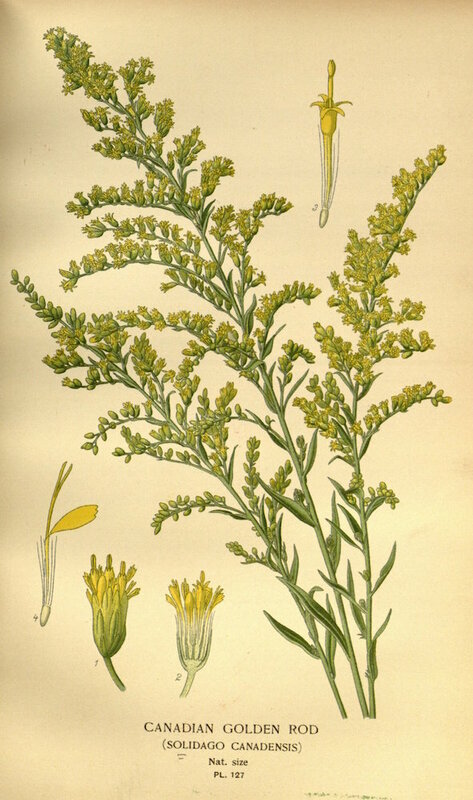 The genus name Solidago is derived from the Latin verb solidare, which can be translated “to make whole.” Goldenrod received this appellation due to its reputation through the ages as a wound-healing drug. This also explains why goldenrod has sometimes been referred to as “woundwort” during its long history as a folk remedy. While not valued much today as a wound healer, goldenrod has been approved by the authoritative German Commission E as a diuretic, anti-inflammatory, and antispasmodic for the treatment of urinary tract disorders. Research suggests that goldenrod can increase the production of urine, which is often helpful in cases of urinary tract infection or kidney stones, without reducing levels of important electrolytes, such as sodium and chloride, the way that some man-made diuretics do. While it is not known exactly how goldenrod produces its therapeutic effects, researchers have focused on several naturally occurring chemicals in the plant. Most experts believe that goldenrod’s ability to increase urine production is due to the presence of flavonoids and saponins, which stimulate the kidneys to release fluid. Another chemical in goldenrod, a phenolic glycoside called leiocarposide, may be responsible for goldenrod’s anti-inflammatory effects. In one study of Solidago virgaurea involving rodents, researchers from Cairo University found that the anti-inflammatory activity of goldenrod was comparable to that of diclofenac, a nonsteroidal anti-inflammatory drug (NSAID) prescribed for conditions such as rheumatoid arthritis. The tannins in goldenrod have been associated with astringent properties. The herb also contains a small amount of essential oil. While not yet popular in the United States or approved for use by the United States Food and Drug Administration (FDA), goldenrod is used widely in Europe to treat urinary tract infections and help eliminate kidney or bladder stones. The Commission E has approved goldenrod as flushing-out therapy for inflammatory diseases of the lower urinary tract and for helping to eliminate and prevent stones. Goldenrod is considered useful in treating these disorders for several reasons. The herb can help to eliminate bacteria and stones by increasing the flow of urine and thereby “washing” them out. As an anti-inflammatory and antispasmodic, goldenrod may help to soothe irritated tissue in the urinary tract and prevent muscle spasms. Goldenrod is not used as a cure for any of these disorders— for example, antibiotics are considered the primary therapy in cases of urinary tract infections—but it can be a helpful component of treatment. In Germany, where goldenrod has government approval as an aid in treating urinary tract disorders, the plant is often combined with java tea leaf, birch leaf, or uva ursi leaf. Compared to other herbal diuretics, goldenrod is considered well tolerated due to its lack of side effects and contraindications. Throughout its history, goldenrod has been used to treat a variety of other medical problems. These include hemorrhoids, diabetes, tuberculosis, liver enlargement, gout, internal bleeding, diarrhea, asthma, rheumatism, enlarged prostate, infections of the mouth and throat, and external wounds. In the Appalachian Mountain region of the United States, goldenrod leaves have been used to prepare blue mountain tea, which is recommended by folk practitioners there to combat fatigue and physical exhaustion. As of early 2000, sufficient scientific evidence to support these additional uses is lacking. Dosage of goldenrod generally ranges from 6–12 g of cut herb per day. The drug, which is recommended for internal use only, can be taken as a tea, liquid extract, or tincture. No matter which preparation is used, it is important to drink plenty of fluids (6–8 glasses a day) while using goldenrod in order to increase its effectiveness as a diuretic. Goldenrod tea can be prepared by steeping 3–5 g (1 or 2 teaspoonfuls) of the herb in 150 ml of simmering water. The mixture should be strained after about 15 minutes. Dosage is two to four cups of tea a day, taken between meals. The liquid extract preparation is usually taken two to three times a day in doses of 0.5–2.0 ml. Dosage for the tincture is 0.5–1.0 ml two to three times a day. While self-care measures such as goldenrod may be an effective component of treatment for disorders of the urinary tract, these medical conditions can be serious and require consultation with a doctor. People who suffer from edema due to reduced heart or kidney function should not use goldenrod without medical supervision. Due to lack of sufficient medical study, goldenrod should be used with caution in children, women who are pregnant or breast-feeding, and people with kidney disease. To ensure optimum effectiveness, protect goldenrod from direct sunlight and moisture during storage. Most studies of goldenrod’s effects as a diuretic, anti-inflammatory, and antispasmodic have been conducted in the test tube or in rodents. Goldenrod’s effectiveness in humans is not well demonstrated as of early 2000. When taken in recommended dosages, goldenrod has not been associated with any significant or bothersome side effects. Allergic reactions may occur in some people. No drugs are known to interact adversely with goldenrod. In Germany, goldenrod has been combined with java tea leaf, birch leaf, and uva ursi leaf without apparent harm.